January 17, 2007 found me working on a project near Mobile, AL. It was mid-week and all seemed to be going well. Around lunchtime I headed back north and east with plans to be home by Thursday night. This would include a swing by our hunting camp located in a very rural part of our state along the Bullock and Barbour County line for an overnight stay. Why not move a couple of deer stands to better locations since I’m already down south? Not likely anyone at the club during the week for me to disturb. I wanted to be better prepared when I came back with Seth to hunt the weekend. When I arrived at the camp house, I was surprised to find one of our members. He had brought a friend as a guest to hunt a couple days when it wasn’t crowded. It was good to have a little company! After going out for an early morning hunt on Thursday, I came back to the house for a quick turkey sandwich. It was my plan to move one more tree stand and then head home. Seems like the guys who were there were a little low on bread and I had plenty. Long way to the nearest store over at Midway, so I told them no need to make that trip right now! For a reason unknown to me at the time, while sharing my bread, I told my fellow club member I was about to move a deer stand and then go home. I happened to mention where it was located…I suppose to be sure I wasn’t intruding on an area they might be planning to hunt. This was hunter courtesy and one of several seemingly insignificant “small things “of the morning. It was not a problem. Eight thousand acres is a lot of space for a couple of hunters! Now all this was working out so well. A great week at work and an upcoming weekend of hunting with my son and some friends…a good plan! 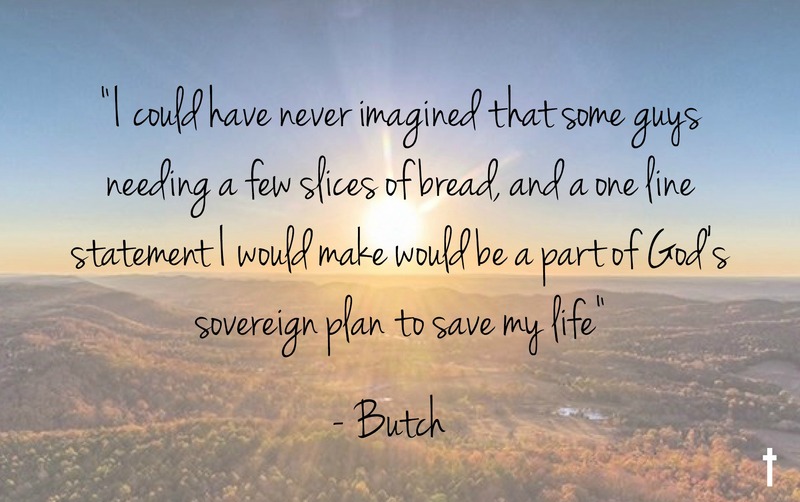 I could have never imagined that some guys needing a few slices of bread, and a one line statement I would make would be a part of God’s sovereign plan to save my life. Thursday, January 18 began like most of my days. The only exception is that Butch was out of town on a business trip…which is a part of his job that I have never liked. I am a bit of a worrier and I am always concerned about his safety whether driving or flying. You might say the day began very ordinary, but little did I know how important an ordinary day would become. 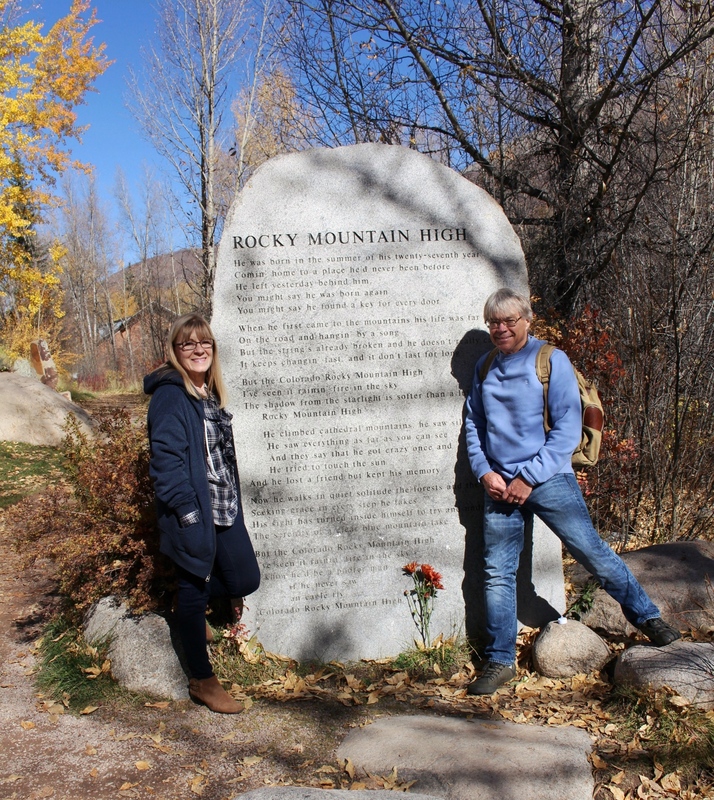 Butch and I had talked about me going with him on this trip, but I was working with several clients on jobs that needed my immediate attention, or so I thought. I would second guess that decision over and over again. If only I had gone, things would have been different. As I left a client’s home around 10:30 that morning, I immediately checked my phone. Butch and I talk all during the day when he is traveling to check in and see how each other’s day is going. I had a missed call from him. He left a message that he was going to move a deer stand and he would call me when he was finished. I tried to call back but realized that cell service in this rural area was very poor. After running a couple of errands I returned home around 12:30. I made myself a snack and turned on the gas logs to sit and enjoy a leisurely afternoon knowing that Butch would arrive later that evening. I thought it strange that I had not heard back from him, which was most unusual. I tried him several times and it immediately went to voice mail. I thought perhaps he decided to hunt. I was a little unsettled. No, I was a lot unsettled! At 1:42, my phone rang and I was certain it was Butch! It was my brother instead. His voice was extremely shaky and I knew immediately something was very wrong. He began to tell me that he had just received a call from our pastor. Butch had an accident and was being air lifted to a hospital in Montgomery! Time seemed to stop. He asked how soon could I be ready to leave and we agreed to meet at our parents’ home. I could only think that I needed to talk to Seth. I called him and left a message to call me as soon as he could. Within five minutes he called and I told him what little I knew. I tried to think what I needed to pack. I could only think what Butch would need. I packed him a bag with several changes of clothes and personal items and only a couple of changes of clothes and personal items for me. I thought I would be back home by the weekend. I had no idea what I was about to face. I drove to my parents’ home and in their arms I found such comfort and love. It felt so good to have Seth’s strong shoulder to lean on as we all prayed before we left. By 2:30 we were on the road. 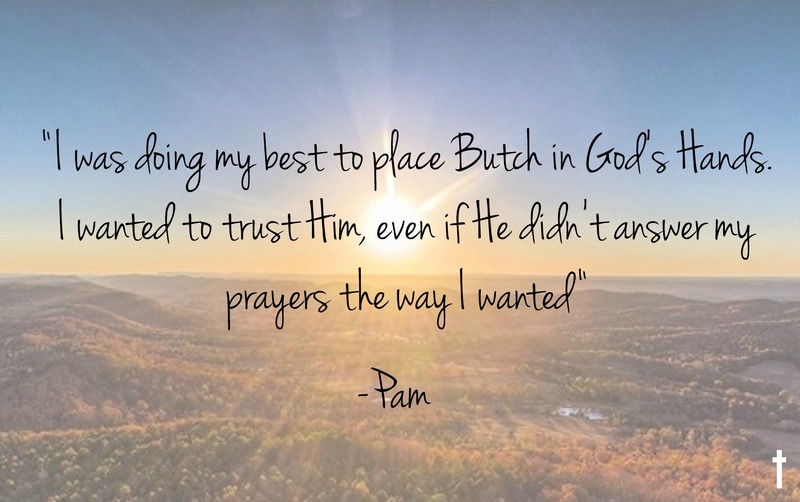 All of this time I was praying for God to please let Butch live. 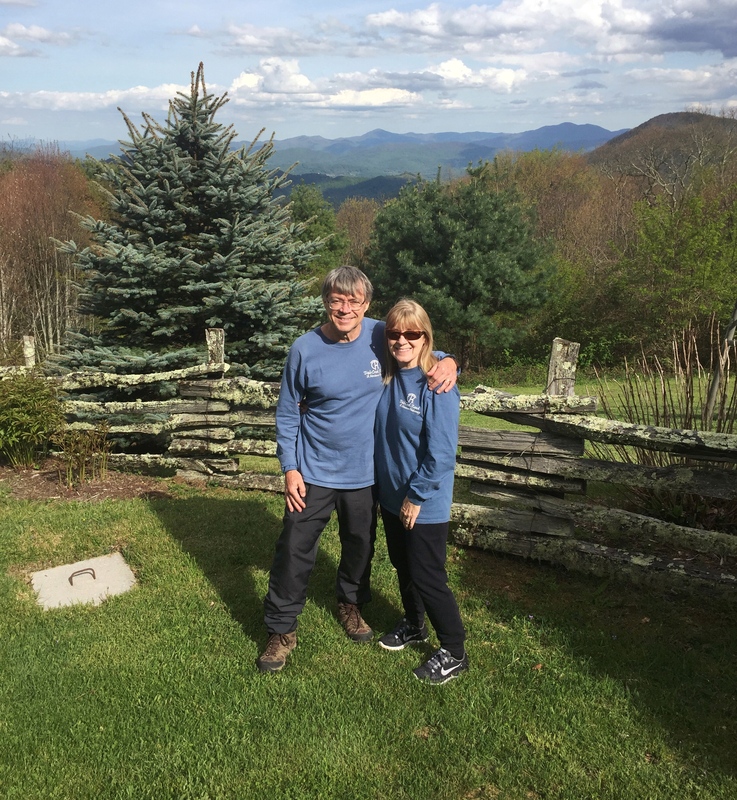 My mind was racing…I couldn’t imagine life without this sweet man that I had been married to for thirty four years. My godly brother’s words of comfort were so needed as he was assuring me that God was in control and we could trust Him. I knew that, but I was having a hard time believing. I was trying hard to trust God and stay calm, but I found that impossible when I received a call from the physician in charge of the trauma unit. Do doctors call family members while they are in route to the hospital? I don’t think so. 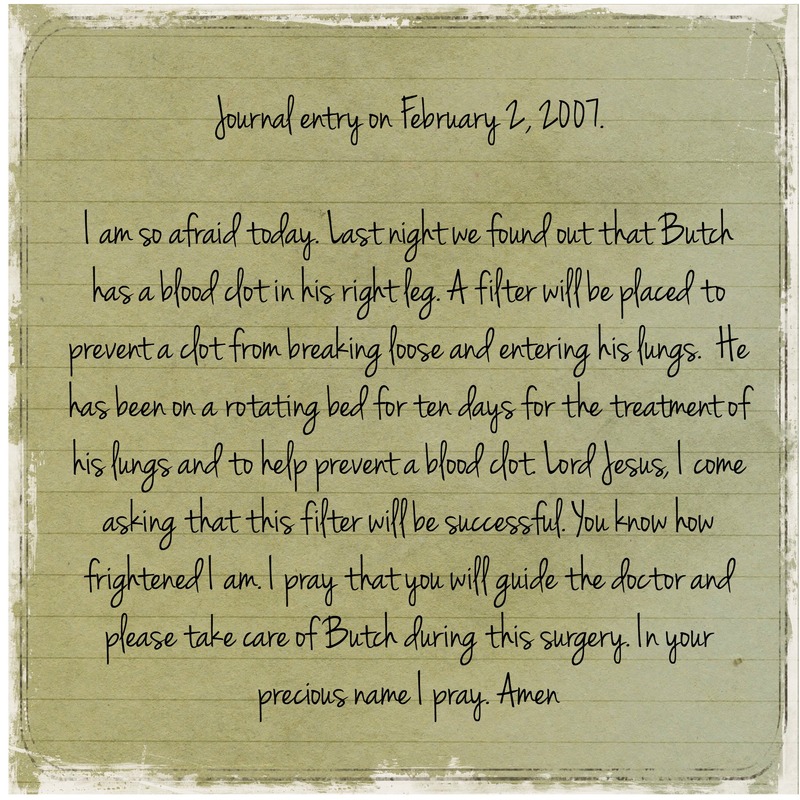 The good news was Butch was alive, but they didn’t know the extent of his injuries. He was unconscious. When I heard the word unconscious, I completely fell apart. 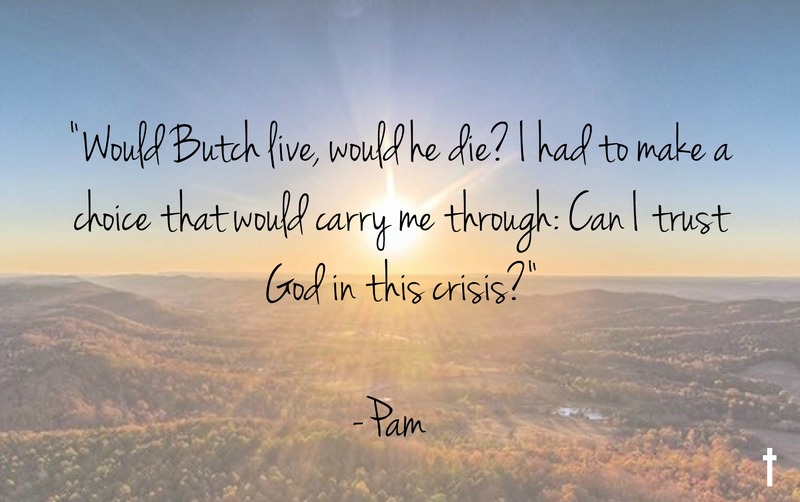 Would Butch live, would he die? I had to make a choice that would carry me through: Can I trust God in this crisis? The two and one half hour drive seemed like an eternity. Upon our arrival, we were met by the chaplain of the hospital and our pastor. He would be taking us to back to the ER. I did not think that chaplains normally did that…unless it was not good news. He opened the curtains where Butch was and nothing on this earth could have prepared me for what I saw. It was a moment forever etched in my memory. That turkey sandwich on the morning of Thursday, January 18, would be the last thing I would remember for about a month. The words I shared with my hunting buddies on the porch would be the last words I spoke to anyone for the same period…with the exception of 4 important words that I’ll share later. Strangely, every year these days on the calendar leave me with an indescribable sense of loss and absence. A mysterious gap that can stir a wide range of thoughts and emotions. Yet at the same time it’s truly a reminder of God’s mercy and miracles. The events of that day and many days thereafter are the beginnings of my story. A story of the supernatural work of God as would be shared with me later by those who were there. A host of alert, caring, and loving people. It all started with a phone call…. Thank you all for entering into our story…and this is just the beginning. We are anxious to share more and more of God’s sovereignty and goodness during one of the hardest times of our lives. Stay tuned next week! I guess the guys decided to go out to the store in Midway to get some bread. Thoughtful of them since I was to return in a couple of days. Hunters are known to share when it comes to food. But interesting to me is the store is on Highway 82 and there was cell service along that stretch of main road. Cell service was non-existent in a lot of places on our club land. That’s significant because while there, my hunting buddy received a cell call from my phone. All he heard was, “I’m hurt really bad”! That’s it. The 4 words! Remembering my earlier comment, he had a good idea where I might be. He was also wise enough to contact Union Springs and get an ambulance and other help on the way. I was found in a hardwood bottom by my hunting buddy who had listened well and knew the area well. You can get lost on a place this big if you aren’t experienced and very familiar with the land. He was probably the only person who knew exactly where to come. Not a coincidence. I was found on my hands and knees struggling to breathe. I had apparently fallen about 25 feet from a tree based on the evidence. I have very poor vision and extremely near sighted. My glasses were gone and my cell phone was in my jacket pocket. It always stayed in my back pack while hunting and my backpack was not close by. Seems this one time I had placed the phone in my jacket pocket (and I keep it in a pocket now when hunting). His phone number was not one I was familiar with but it was stored in my contacts. With help of medics and others I was transported by ATV, 4 wheel drive truck, and then ambulance to a field where the helicopter was already waiting. It is clear that if the only person who would’ve known how to find me was not there, didn’t listen well, or either of us had no phone service, no one had reason to miss me until that night or have a clue where to search. A few hours too late no doubt. The fact that I was in the trauma center in Montgomery in what was maybe only a couple of hours or less is an absolute miracle. I understand that emergency personnel called for the helicopter even before arriving and knowing the extent of my injuries. 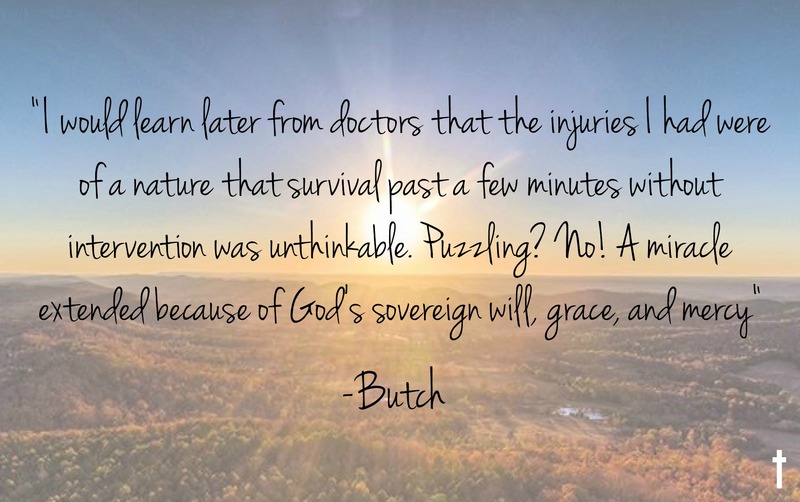 I would learn later from doctors that the injuries I had were of a nature that survival past a few minutes without intervention was unthinkable. Puzzling? No! A miracle extended because of God’s sovereign will, grace, and mercy. 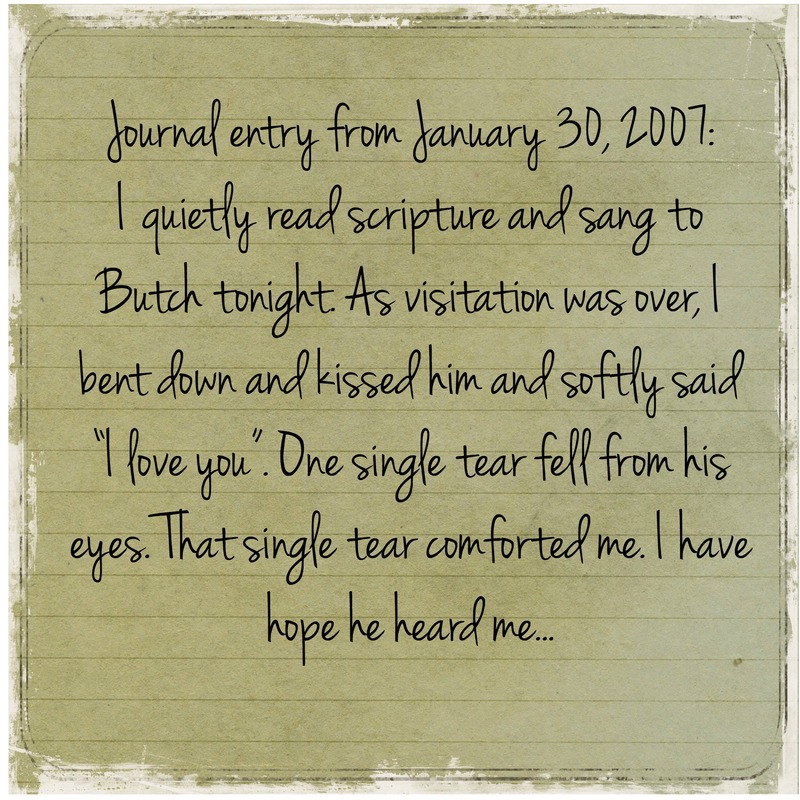 When the curtain was pulled and I entered the ER, Butch was completely still. I touched his face, no response. I held his hand, no response. I whispered I love you, no response. There were all kinds of machines hooked to him and a ventilator was breathing for him. His hunting clothes were all crumpled and lying in a corner, they had been cut off of him. Tears came like a rushing stream. Was this real or a dream? This wonderful man that I met in 1970, when I was only sixteen, had always been a tower of strength…a real man’s man! He was a marathon runner, a weight lifter, a hunter, a real outdoorsman who could do anything with his hands. He was smart with a gifted mind that could grasp and learn anything! He was so talented…a singer, songwriter, and musician. His work ethic was second to none. But with all of his strengths, he possessed the qualities of gentleness, kindness, and meekness. He had loved me so well through almost thirty-four years of marriage. This just couldn’t be happening to us. I thought I would always have his strong arms around me through all of life’s sorrows and heartaches and now he was fighting to live. He was too young! No this wasn’t really happening. At this point, I knew that both of his lungs had collapsed and chest tubes had been inserted. Little did I know this would be the beginning of hours, days, and weeks sitting in a hospital intensive care waiting room praying for a miracle. The sun would rise the next morning and it brought hope of some good news. That didn’t happen, there was no good news. Over the next couple of days there were neurologists, pulmonologists, orthopedists, and more specialists than I can even remember that attended Butch. I was given information that I couldn’t even begin to process. The kindest and most reassuring doctor was the trauma specialist who saw Butch two to three times each day. He was a believer and didn’t hesitate to tell me that they were doing all they could, but ultimately it was in the hands of our Creator. I knew that…and I was doing my best to place Butch in God’s Hands. I wanted to trust Him, even if He didn’t answer my prayers the way I wanted. Over the next twenty days, I stood by his bedside four times each day at every thirty minute visitation. I can’t begin to describe those days, it would take a book to hold it all. So many days of heart-wrenching news…pneumonia…staph infection…blood transfusions…hemorrhaging around the brain. One of the toughest moments was when the neurologist, with absolutely no bedside manner, said, “I don’t know if he will live, and if he does I can’t say there won’t be brain damage.” I crumbled. There were a few days that our sweet trauma doctor said there was slight improvement, I clung to the hope he would survive. I would be remiss not to mention how family and friends stood by us during this dark time. I was never left alone during these long days and nights. The round trip drive from Gadsden to Montgomery is almost three hundred miles. So many made great sacrifices to bring comfort and love. Through church friends of my precious cousin that lives in Montgomery, I was given the use of a two bedroom 2 bath guest house for as long as I needed it. It was fully furnished and was truly a God-send. I didn’t want to leave the hospital, but I was physically and emotionally exhausted after four days and nights without leaving. I was only at the house to sleep, but different friends would stay with me each night. While I was away at night, at least one friend was always present in the ICU waiting room. Gift baskets of food came pouring in as well home-prepared meals and gift cards. Every possible need was met by our family, our loving church, our pastor and his wife, our friends, and business associates. I will never forget all the kindness that was shown. As a matter of fact, I kept every card that was sent as a reminder that our great God will meet all our needs. Waiting was excruciating, but I found great comfort and peace in God’s word and prayer. I was on a journey of trusting God…and eleven years later I am still on that journey. Psalms 91:1-2 has always been a favorite passage because He is my refuge and I am still learning to trust Him. This was too big for Butch and me. An enormous mountain we could not climb. I would have to trust God to make it small enough for us to make it over, knowing He would be with us every step of the way. I prayed my wishes and His will would be in harmony. God is always working and he wasn’t finished writing this story! “I believe that I shall look upon the goodness of the Lord in the land of the living! I began to regain consciousness in mid February. The first few days remain very vague to me. What was going on around me was confusing and strange and I wasn’t sure where I was or why. My inability to do anything and the horrific pain were the only certainties. I couldn’t swallow. I thought I’d never be able to walk again. Things were a blur. I am still amazed at the one thing I do clearly remember. It’s the first thing that I really understood. I heard voices quoting scripture. I learned that my pastor and brother-in-law had sat at my bedside and read the Bible out loud to me for hours. Butch was improving! I can’t begin to tell you the overwhelming excitement and joy when the doctor decided to take Butch off the rotating bed and to remove one of his chest tubes. The following day, which was day 21, I was shocked and overcome with emotion when the doctor said he was fairly confident that Butch could now breathe on his own. He was going to remove the ventilator! Tears of joy! Prayers of thanks to our Heavenly Father! Our great God had truly performed a miracle! The next day Butch was moved out of ICU and we were given a two room suite on the same floor. Yes, a suite!! One room was set up like a hospital room with a pull-out bed. The other room had two sofas with one making into a bed and a small kitchenette! I could be with Butch 24/7. Our loving Father continued to take care of our every need. We would spend nine days in the suite. Progress was very slow and painful. A few days later, after being moved to Lakeshore in Birmingham, I began to understand more and to experience God’s peace and presence in all that was taking place. I learned of head trauma and numerous broken bones including my back in a number of places. Twelve broken ribs had punctured both lungs. The impact from the fall had taken a toll on everything inside of me. Amazingly all blood loss was internal. I didn’t have a scratch on me. I had experienced blood clots, staph infection and pneumonia among other things! The road ahead would not be easy. What I faced was big. Too big for me! But God strengthened me and I began to make progress. I understood from those that attended me that the recovery to some level of “normal” would likely take 18 -24 months. I could not face that without God, family, and friends. I didn’t have to! They were all there for me. As the days moved on, I continued to learn and experience things that touched me much deeper than these injuries could ever reach. Pam’s life had been put on hold too. Her love and devotion to me and her tender care for me around the clock for weeks without rest brought emotional and physical healing to me. When I wasn’t aware the world even existed she was there. She was surrounded by so many that loved and cared for me by loving and taking care of her. The outpouring of prayers and provisions during this journey was astounding. Pam and I lived through the same thing but in a totally different way. I was home for the first time in thirty-one days! As I pulled up our winding driveway, the emotions of the long days and nights were overwhelming! The house was quiet and dark, no one but me. I was past exhaustion. Sleep didn’t come. Butch was in rehab and was alone for the first time. I wanted to be with him. I arrived early the next morning for the first day of his therapy. He had not walked since he climbed a tree on January 18. He totally amazed the doctors and me with his first attempt using a walker. They were expecting two or three steps! No, not my determined man…fifty feet, 3 different times! For the rest of his stay, I was permitted to visit after 4 in the afternoon. I never missed being there. 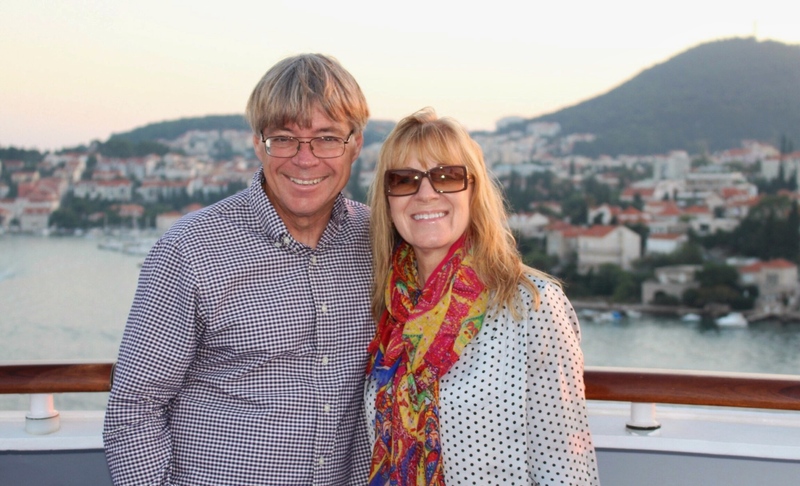 February 23rd was a celebration…our thirty-fourth wedding anniversary. It was unusual, we had never celebrated in a hospital! But what a beautiful time of thanking our Father for the gift of life. There were so many days that I thought this anniversary would never happen. I arrived at Lakeshore with all the fixings for a romantic dinner. China, crystal, silver, table linens, pink roses, and a home-cooked meal I had prepared. I had candles and the staff allowed me to light them, overlooking obvious rules. I turned off the harsh hospital lights and with the flickering candlelight we wept. God had answered our heart cries. After dinner and cake for dessert, Butch had a surprise. He handed me a small box. Where did he get this, how did he have a gift? That would be impossible. When I opened the box, there was the most gorgeous tanzanite and diamond ring…I couldn’t believe it. My loving and thoughtful husband had purchased it before the accident and had tucked it away. He had the memory to tell our son where it was. Amazing how God was restoring his mind as He was his body! There are dozens of things I could share, but out of consideration to you who are so gracious to take time to read our story, I will share only one. The time had come for Pam to go home and sleep in our bed and just be at the house for a few hours. I was only 60 miles away from home now and I encouraged her to go rest. I didn’t want her to leave me but certainly never admitted it. That first night was one of the most unusual nights I’ve ever experienced. It was late and quiet. I became scared and I have never felt as lonely as I felt that night. I later started running a fever and it became very high. A nurse came in that I had not seen before. It was not her normal floor and she was only filling in for someone. She was a follower of Christ and her Father was a pastor in their home country of Kenya. She tended my needs but stayed and shared stories of how God was working in Kenya. She then took both my hands in hers and prayed one of the sweetest prayers I’ve ever heard. She went on her way and I never saw her again. Maybe an angel who borrowed a nurses uniform! With prayer and by God’s grace I would come home in March. Our little abode looked like a castle on a hill to me. A friend who is now in heaven visited us a few days later. She opened her Bible and showed me an underlined verse with my name by it. I found out she revealed the verse to Pam at the hospital early on and had claimed it for me. It is found in Psalm 118:17 which reads; “ I shall not die, but I shall live, and recount the deeds of the Lord”. Scripture tells us clearly that we have an appointment with death and afterwards the judgement! I may die today but January 18, 2007, was not my appointed time. I’m still not sure of all the reasons God spared me, but for sure one reason is that I may recount His wonderful deeds. There will forever be physical reminders of all that happened, as you never get completely over these type injuries. But for the record; God has allowed me not only to walk again, but He lets me run! My Doctor once told me that a surgeon could improve the scars where tubes had been and eventually they would fade away. I chose not to do that. I see the scars every day and remember Whose I am. May we always be aware that God makes small things big to reveal to us His constant presence in our everyday living. He makes big things small to demonstrate His power and sovereign grace. He makes all things for our good and His Glory. And one day He will make all things new!